We absolutely couldn't resist adding this monstera felt flag to our growing botanical art collection. 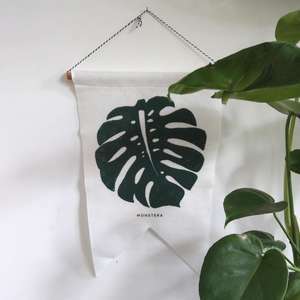 Featuring plant of the moment, the monstera (for all your #MonsteraMonday hash tag needs), the felt flag is hung from copper pipe and monochrome twine. 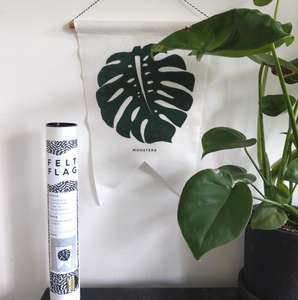 The Monstera felt flag by Studio Wald is hand screen printed in the UK on natural white felt and is supplied in an attractive white poster tube. The flag measures 38 x 28 cm.